Kettler Coach E rowing machine sells at the same price point as some of the most elite rowing machines in the industry. Thus, it is normal to expect only the best from it. What does it offer? Is it worth its price tag? Is it the best alternative to Concept 2 rower and other topnotch ergometers out there? In this article, we will review Coach E’s key features and provide answers to these questions. What has Kettler Coach E rowing machine got to offer? As the most high-end in Kettler’s lineup, Coach E must prove its worth. In this article, we’re set to evaluate how it measures up to different requirements. We will use the results of these multiple yardsticks to find what sets Coach E apart from the rest. Appearance: There’s nothing fancy or superfluous about Kettler’s look. It has a solid frame with compact front base which houses the flywheel and resistance mechanism, built-in monitor, front support, and footplates. The beam and sliding rail look sleek and strong. The rear support looks solid. Using this indoor rower firsthand confirms our initial impression about its solid build. The frame is made of high-carbon steel and is designed for a maximum user weight of 285 pounds. The double-guided steel rail is chrome plated and the seat glides on sealed ball bearings. These features will give the user a fluid and fail-free drive each time. Fully set up, Coach E measures 80” x 20” x 26”. It sits low from the ground, and its extra-long seat rail accommodates users with long inseams. It’s quite heavy at 104 pounds, which is around the same as the weight of water rowers with water in their tanks. Its solid build accounts for this weight, which also makes it very steady. This stores upright on a 20” x 26” floor area. It has caster wheels so you can move it to a corner. The built-in transport casters are small in size and may be difficult to roll on carpeted floor. Remember that Coach E is on the heavy side, so it will be a hassle to lift. The best way is to roll it on uncarpeted floor not too far away from storage. Kettler backs its product with a lifetime warranty on frame and 3 years on parts. That kind of peace of mind is not easy to come by these days. We’ve looked around and saw only one other company that could equal Kettler’s confidence in its product—that’s hard to beat! Even Concept2, which is commercial grade, doesn’t come close. For residential use, this rowing machine doesn’t require much in terms of maintenance. The bearings underneath the seat don’t even need lubrication. You can have a clean cloth handy to wipe sweat and dirt off after each use. Regularly wipe the seat rail, too. Preventing a buildup is so much easier to do than waiting for something to clog up. For parts that may show wear and tear or need replacement after years of use, contact Kettler USA for applicable warranty and assistance. The dimensions of Coach E are perfect and allow full range of motion on both legs and arms even for tall people. There are no restrictions of any sort. The seat height is set low. While this low height is not a disadvantage, it is something that prospective buyers should know about before they make a decision. They can observe users working out in videos available online. The seat is padded generously for maximum comfort. The tilting footplates allow the feet to pivot naturally, and each footplate has a strap for securing feet in position. And now to the crucial technical part—the resistance mechanism. The resistance created by the rower is what makes a workout possible. The more resistance is available, the greater is your opportunity to work out your body. • Resistance mechanism – the Kettler Coach E rowing machine operates on its proprietary Kettler Induktions Brake System. This electromagnetic resistance mechanism provides frictionless and adjustable resistance. Youngsters and adults alike can choose from a wide range of resistance (25 to 500 watts) to find the level of challenge that they want. 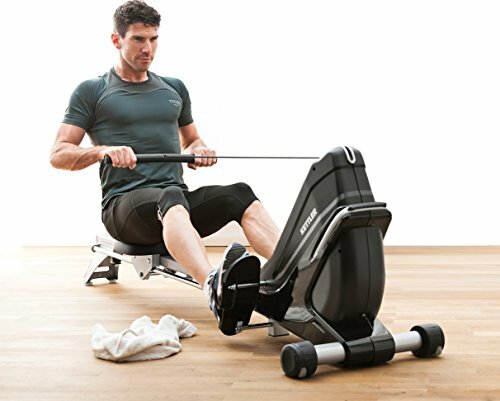 • Noiseless operation – being a magnetic resistance rower makes Coach E one of the models with high-end resistance yet noiseless operation. For this reason, users who are looking for heavy-duty rowers for residential use prefer it over other rowers in this class. That’s just half of the package. 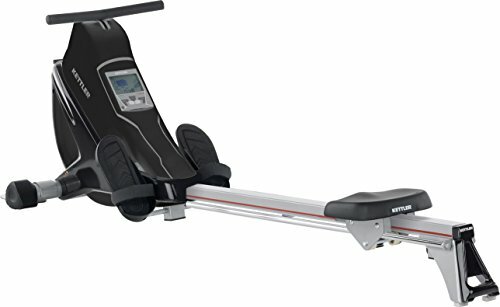 For users to fully benefit from this upscale rower, they’ll need the equally sophisticated Siemens LCD computer monitor which comes with it. The monitor’s modest look does not justify what it’s capable of doing. • Tracking – it tracks your time, distance, energy, strokes, pulse rate, and frequency. • Adjust resistance – the monitor displays your current resistance level, together with your stats. You can increase or decrease your level using buttons below the monitor. • Preset workouts – Coach E comes preprogrammed with 12 workouts including interval, pyramid, and recovery workouts. • Cardio program – included in the 12 preset programs are two heart rate workouts. Unlike other indoor rowers, Coach E comes with its own T34 wireless chest strap to accurately monitor your heart rate during a workout. Something’s unique about all these heart zone features—it’s the way that the computer automatically adjusts the level of resistance to keep your pulse at your targeted rate. • Scan function – one concern is that the monitor is not backlit and the displayed numbers are not easy to read with the dot matrix graphics used. One way to get around this is to use the scan function and set the particular metric that you want to track. It will be displaced in the center of the readout at a font size that’s larger than the rest. As to the absence of backlighting, it would be best to do your workout in a well-lit room. What we’ve presented so far may look like it’s everything that you’ll ever need from an indoor rower, but Coach E has more. The people back in Kettler thought you could have more. • Beyond-rowing bonus – Coach E comes with the patented Quick Attach backboard and front step board for 16 non-rowing training exercises. We remember in another review where someone asked what else could he do with an indoor rower. At that time, the question seemed ridiculous. Seeing this bonus from Kettler, however, we’re thinking that perhaps that person had a point. You can do more than rowing in your ergometer, which actually makes sense if you don’t have space at home for other gym accessories. • Quick Attach vs. online competition – with the Quick Attach accessories, you’ll be able to use your rower for abdominal exercise, bicep curls in various positions, pull-overs, and arm extension routines. This mini-gym add-on does not appeal to some users, though. Others can’t help comparing it to the PC-functionality of Concept 2. If you share the same view—that a rower must have the ability to connect to the online community for worldwide competition and ranking—then Coach E does not make the cut as the best alternative to Concept 2 rower. People have different views about this because there are those who don’t find online presence as a critical aspect to consider in buying a rowing machine. 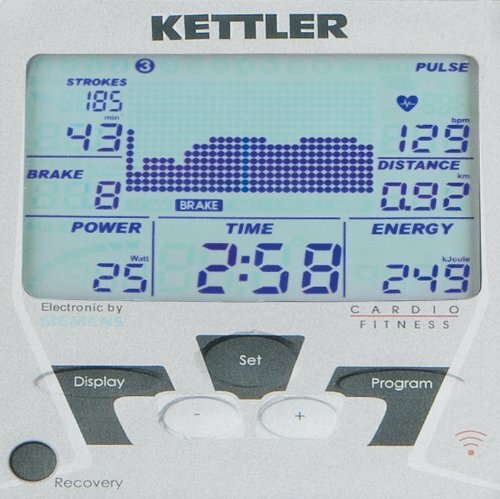 Kettler is a German company known in the sports and fitness industry as a maker of indoor rowers, elliptical machines, and other similar equipment. It has been around for almost 70 years now, and is sought after in Europe, though it’s just starting to gain popularity in the US. Kettler’s rowing machines are highly regarded for their rock-solid quality and cutting-edge technology. In today’s world where manufacturing is mostly done off-shore, Kettler has kept its main production activities within its German factories. So what sets Kettler Coach E rowing machine apart from the rest? • First, it is built to last. That, you can’t take away from Kettler. • Second, its lifetime warranty is a rare thing in this industry. It’s another testament to Kettler’s outstanding build quality. • Third, though the Siemens computer/monitor comes short compared to PM5 of Concept2, you can’t deny its usefulness and accuracy. • Fourth, its extras are a welcome change in the industry. • And fifth, Coach E’s resistance is one of the best and quietest, and it has the widest range. While Kettler’s Coach E is evidently feature-packed, it does seem over-priced. If Kettler upgraded Coach E’s computer monitor to offer a backlit display with a bigger readout and include PC functionality, perhaps buyers would start looking beyond its price tag.